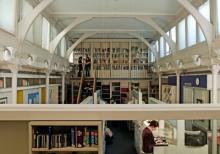 The Visual Cultures Resource Centre (VCRC) is unique within The University of Melbourne. First established in 1947 by Professor Joseph Burke, the image collection now comprises over 250,000 slides and photographs, 85,000 digitised records and a film collection of over 1,000 titles. There are also 7,000 image related books and periodicals, alongside the School's thesis collection and associated multimedia. The Centre acts as visual resources laboratory for teaching, learning and research in the School of Culture and Communication. 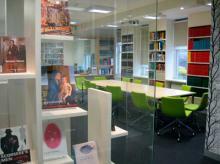 It is a non-lending, research only library, with dedicated viewing spaces for film and professional editing suites. 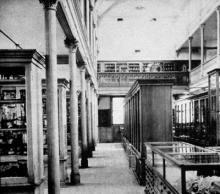 Described as one the largest collections of its kind in the southern hemisphere, VCRC's history dates back to the founding of the Art History Department and includes historic glass-mounted slides, lantern slides and photographs from the Courtauld, collections from the Witt Library, the Carnegie Reference set and Illustrated Bartsch. They are classified using the Harvard University, Fogg Art Museum Classification system. A recent addition to the VCRC is the Women's Art Register, a collection of national significance that documents Australian women artists and contains over 10,000 images, and 15,000 images from the Monash slide collection. To satisfy conservation requirements the collection is housed in a climate controlled environment. The slide and photographic archives are available to academic staff, students and researchers. In recent years the VCRC has gone through a program of digitisation of its vast collection. To date the database contains 85,000 records and 22,000 image files. To ensure the most accurate representation of images as possible the Centre maintains high-end scanning equipment such as dedicated Nikon film scanners, high-resolution monitors and an A3 flat bed scanner. Academic staff can make requests for images from the collection to be digitised in support of their teaching and research. Other digitisation services include flatbed scanning and photography of new material. All images are saved and stored in two formats: medium resolution jpegs suitable for teaching and online presentation and an archival Tiff file of approximately 18 MB each. High-resolution files that would be suitable for publication purposes, subject to copyright, can also be made available. Access to the on-line image database is password protected and only available to staff from the School of Culture and Communication. At this stage student access to the image database is limited to computer terminals within the Visual Cultures Resource Centre only. Learn more about the Image Library and Image Database by reading "Caught on film: The story of Melbourne's original visual archive" (55kb pdf) by Benjamin Thomas, emaj Issue 3, 2008. The Centre maintains a collection of films used to support teaching and research for Screen and Cultural Studies, Australian Indigenous Studies and other School programs. The collection has over 1,000 titles in 16mm film, DVD and VHS. It is library policy to purchase films used in the curriculum making them available to academic staff for use in screenings and for student research. Teaching staff placing film orders are advised to contact the VCRC as early as possible to ensure screening schedules are met as some films are sourced from overseas or interstate. Approximately 100 to 150 cinema titles are scheduled for teaching each semester. Films can be viewed in the Centre's dedicated viewing rooms and a booking sheet for the viewing room is also available. 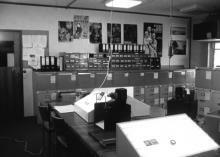 The VCRC holds memberships to various film archives such as the Australian Centre for the Moving Image and The National Film and Sound Archive, giving the School access to material that is otherwise unavailable. The Centre can also transfer VHS to DVD, not subject to copyright restrictions. VCRC also supports a media centre. Including two dual screen editing suites, operated with high end Mac computers, industry standard software such as AVID and accompanying sound systems. Other audio-visual facilities include a data projector with a drop down screen that can operate as an alternative viewing space for 12 people, new, flat screen monitors designed for individual study that accommodate a variety of formats including Blu-ray as well as XBox and Playstations for the Game Studies discipline. The VCRC also provides technical assistance to guide teaching staff in the use of audio-visual equipment for lecture and seminar presentations, as well as guidance on standards and procedures for image presentation and copyright. To support teaching needs the library has some audio-visual equipment available for loan. Teaching staff and graduates may borrow, subject to availability, a portable data projector, slide projectors, and a digital video, stills camera and tripod. For equipment being taken off campus 'advice forms' need to be completed. The Centre holds Bachelor of Arts Honours, Master of Arts and Doctor of Philosophy (Arts) theses by the students of the School of Culture and Communication. There are currently over 2,500 titles. Students are often referred to the VCRC by their tutors and lecturers to consult the thesis collection. A complete searchable catalogue and printouts are available on consultation with library staff. Theses can only be viewed in the Centre - lending or photocopying is not permitted. A number of our theses are now held off campus at Dawson Street, Brunswick. Requests for theses held off site usually take one to two days. The Visual Cultures Resource Centre Thesis Collection database contains more than 1000 entries. Records date from the 1950s to 2013. Over the decades thesis topics reflect patterns of staff expertise, accessibility to primary resources, as well as trends in theoretical approaches. Many contain valuable unpublished research findings and are still consulted by students, staff and researchers from institutions such as the Art Gallery of New South Wales, the National Gallery of Victoria and a range of regional galleries. The database includes theses by Leigh Astbury, Janine Burke, Jane Clarke, Ann Galbally, Robert Gaston, Kelly Gellatly, Edward Gott, Charles Green, Alison Inglis, Margaret Manion, Christopher Marshall, Chris McAuliffe, Angela Ndalianis, Virginia Spate, Gerard Vaughan, Vera Vines and Anthony White. Other resources in the VCRC include a significant book and periodical collection comprising a reference collection, monographs and rare books. Some titles are unique to this Centre. Other resources include historical archives such as catalogues and exhibition invitations that belonged to Professor Joseph Burke. Subject readers, support material for current teaching, viewing rooms and light filled study areas for group or individual research.